Happy Monday! How was your weekend? Emma here and my weekend was pretty awesome. I went to a family reunion pool party, the weather was gorgeous, I got to see my favorite people, and I finally got a decent tan going. I also had one of these and, let me tell you: it’s the new Slurpee. When I don’t have to run in and fill it up (just go through the drive-thru), that totally works for me, especially when it’s 90 degrees outside. And let me tell you, it is d e l i c i o u s. Anyway, we hope your weekend was full of fun, too! We’re kicking off this intensely hot Monday morning with a brand new giveaway from the amazing Jane of Jacaranda Designs! 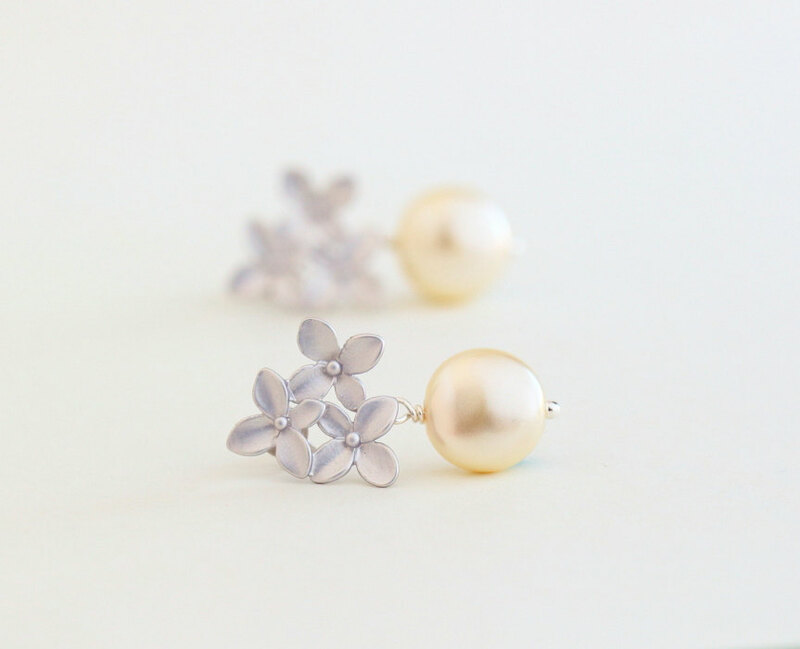 When Jane wanted to give away a pair of these silver and pearl earrings, we couldn’t wait to share them with you. One lucky reader will receive this pair that features a triple flower hydrangea bouquet design. 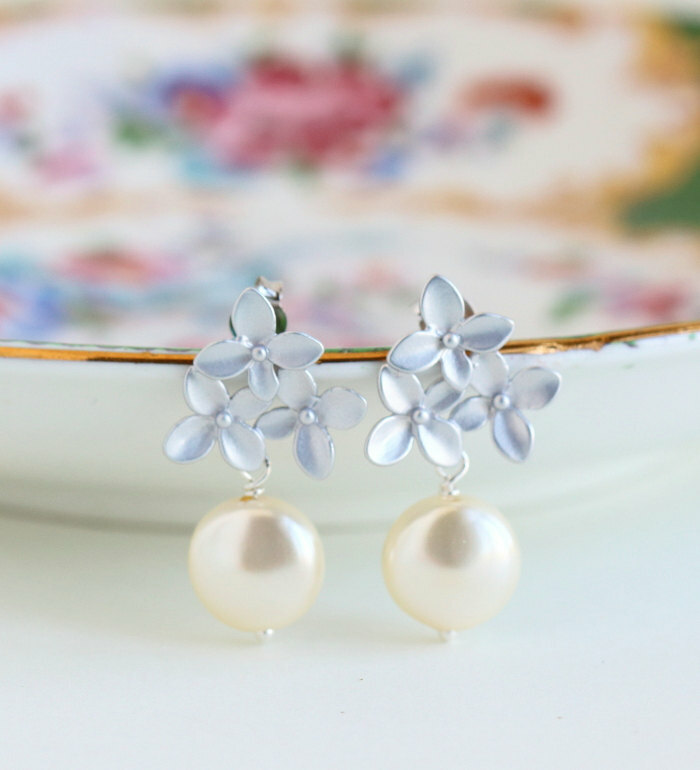 The earrings have a cream Swarovski glass coin pearl that has a brilliant luster. The flowers are matte silver plated brass with sterling silver posts. These are ideal for a classic bride who wants a unique and eye-catching design. Take a look! Want to win a pair of your own? The full details are below! RELATED: Giveaway: Win a Set of Wedding Table Numbers! There’s more coming up next, so stay tuned! In the meantime, feel free to browse our popular posts. They’re quite fetching. Love the ring with the map of the world! 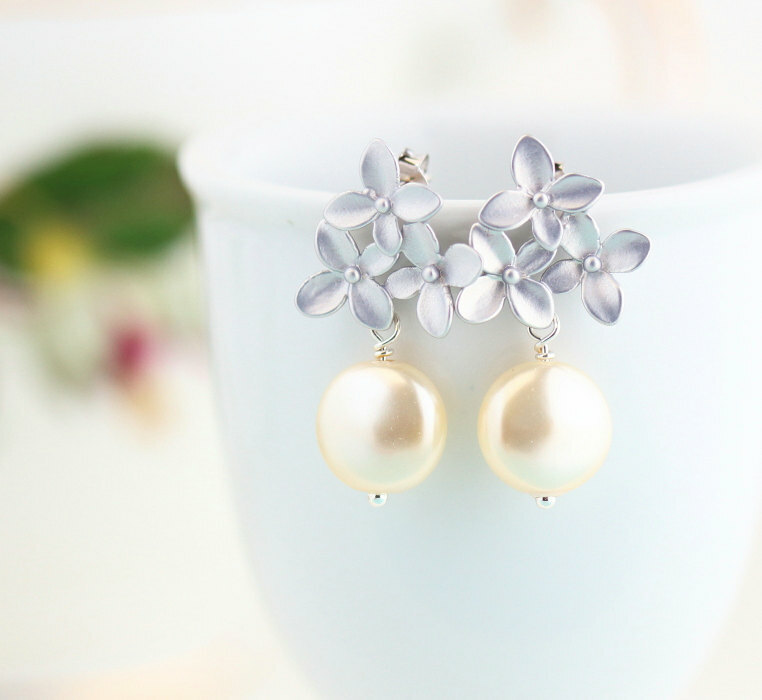 The Coral Pink Flower Earrings are beautiful. I would love to win the pearl ones. LOVE & NEED the brass travelers necklace. Adventure is out there! The ball of yarn earring are so gorgeous, my favorite! The Vintage Style Sunflower necklace with the bronze pearls is my favourite! I love the Gold Dangle Earrings, Sea Foam Earrings! I love the Necklace, Cameo Necklace, Cameo Pendant, Spring Flowers, Brass Frame Cameo. I am loving the Pale Peach Flower Necklace! It’s just like one I lost when I was younger. I’ve been looking for a replacement for it! I love the wire wrapped birds nest necklaces, with the blue robin’s eggs. They are so unique & pretty! I love the Turquoise Earrings With Gold, Moroccan Style! Love the gold inlaid Moroccan style vintage lucite bead on the bronze chain. Beautiful details! These earrings are gorgeous! I also adore the bird leverback earrings – so cute! I love the Rome map post earrings! I looooove the honey bee necklace. The garnet colored glass is beautiful. I love the music earrings! Favorite is the woodland acorn earrings in peacock blue! Dangle gold & royal blue earrings! i love the golden shadow swarovski crystal dangle earrings! I love the purple vintage jewel earrings! I like the turquoise necklace with the gold bird. These would look adorable with a lace gown!